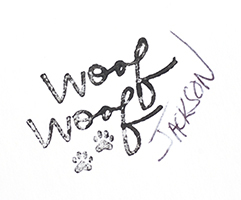 Woof, woof,I’m tired, but I am behind on my blog so I am starting it tonight (Saturday) and will finish in the morning, ruff! We have been so busy since the last time I wrote. We drove from Bryce Canyon to a town called Moab. What a busy and interesting place! We had a hard tiime finding a place to stay, but we did. There are a lot of humans here, racing, riding, and driving big cars and trucks out in the wilderness and city, ruff. 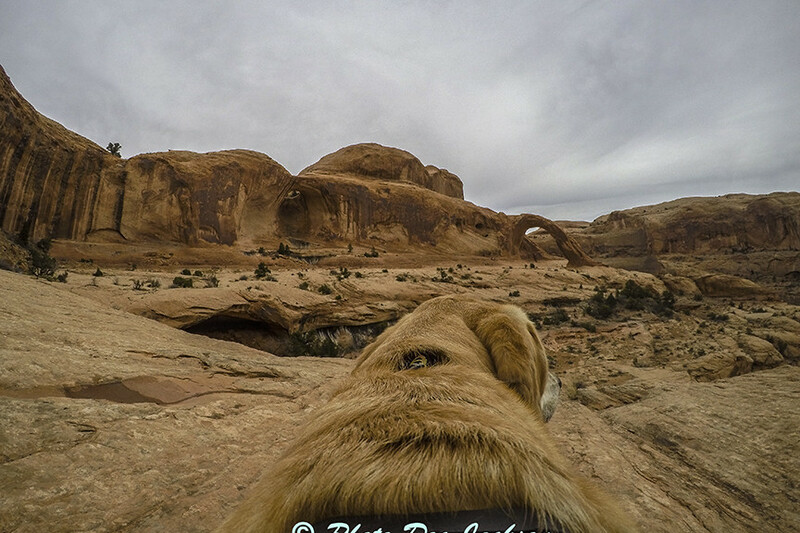 We have been visiting two parks here, Matt said they were called Arches and Canyonlands. My human also found out about some places I could go for a hike so we went to a place called Portal Arch. Matt put on my boots so I wouldn’t hurt my feet on those nasty sticky plants. We had a big surprise on the hike and I had to climb up some rocks while my human climbed up a ladder, but I made it okay. then we had to go back, but Matt figured out how to help me. He is pretty smart for a human. 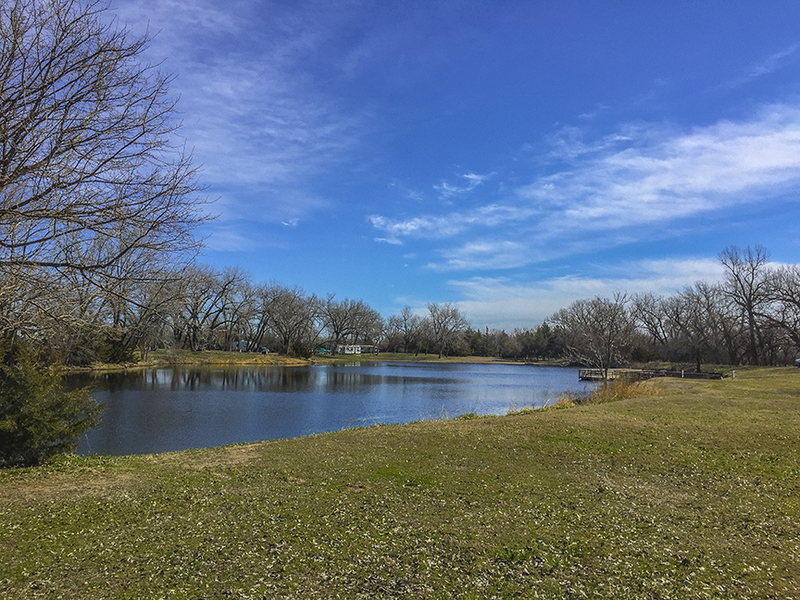 We explored the two parks for two days and it was so different than what I am used to at home. Hardly any trees and you can see a long, long way off, ruff! 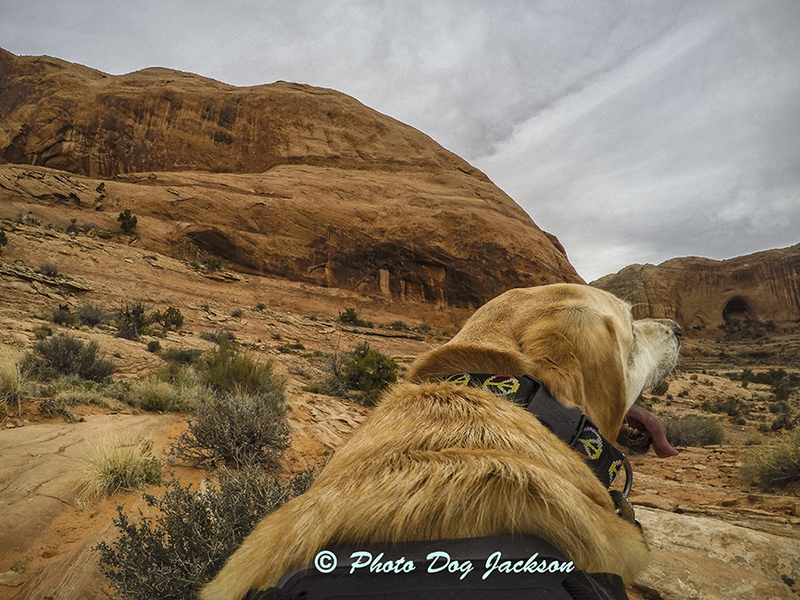 Me hiking on the Portal Trail..
We got up early today on Sunday, my human said something about time changing. I don’t understand what he meant about that, how does time change? Humans are so strange sometimes, he said it was an hour later, but it looked the same to me. Matt told me I will be going to a new state today, one I haven’t been to before. I think I am beginning to understand what a state is. Each one looks and smells so different than the other. 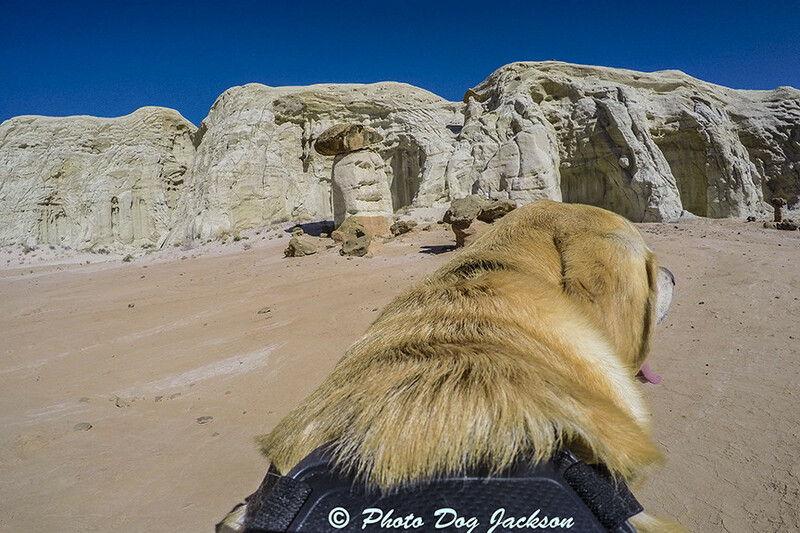 He says we will be going to some more canyons, those are deep holes in the ground and when you are in them you can’t see as far, but you do see some amazing thing like big rocks, sometimes there is a river and sometimes there isn’t, woof! Woof, woof! 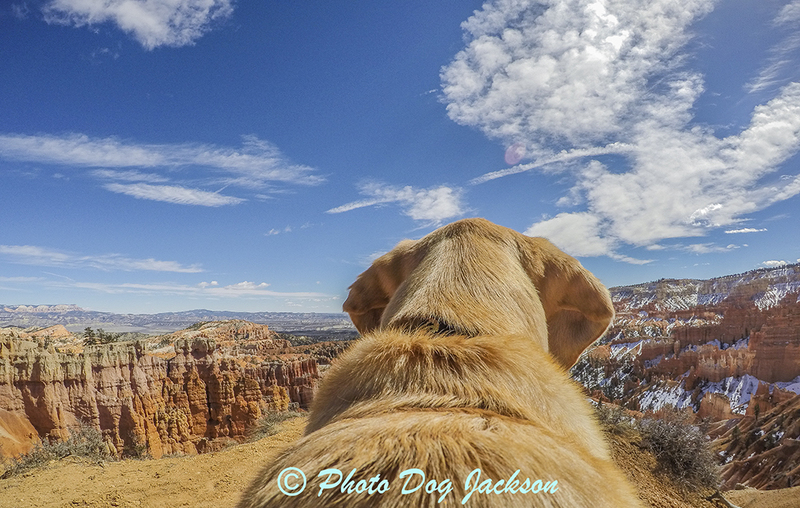 We are now in Zion National Park my human tells me. I told him we needed to stay somewhere in a real room for a few days to rest. He had worn himself out even when he thought he was taking things easy. He says we have driven 3,700 miles, ruff I am not sure what a mile is so I asked him about that. He said there are about 2,000 human steps to a mile so I cannot imagine how many steps that would be such a big number and it would even be more in doggy steps, ruff! Two days ago we left Page Arizona and went to another state. I am beginning to understand what a state is I think, each one looks so different and the humans talk different too. At some of these places the humans talk in languages I don’t understand, things my humans say are hard enough sometimes, but I don’t understand any words some of those other humans say. Matt told me they are from different countries. What are countries, are they like states? I just don’t know, I am learning so much on this trip. 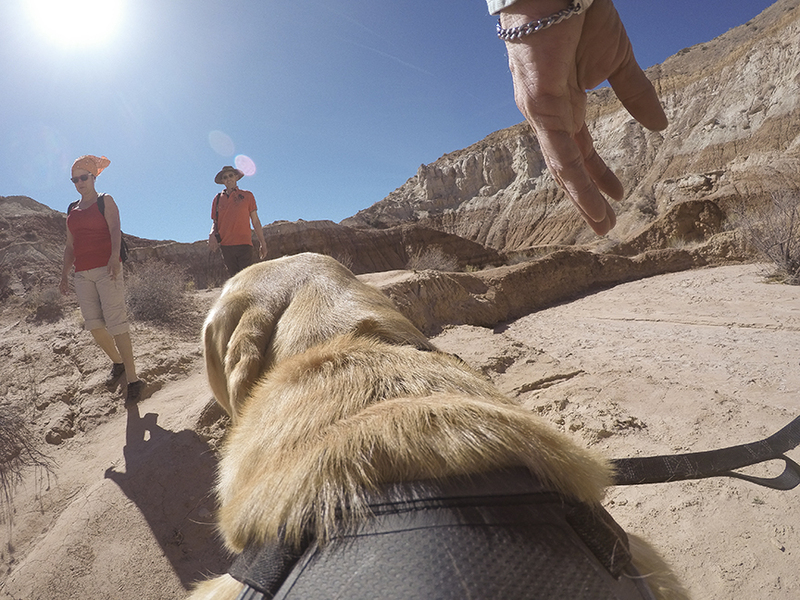 Humans I met on the Toadstool Trail hike. 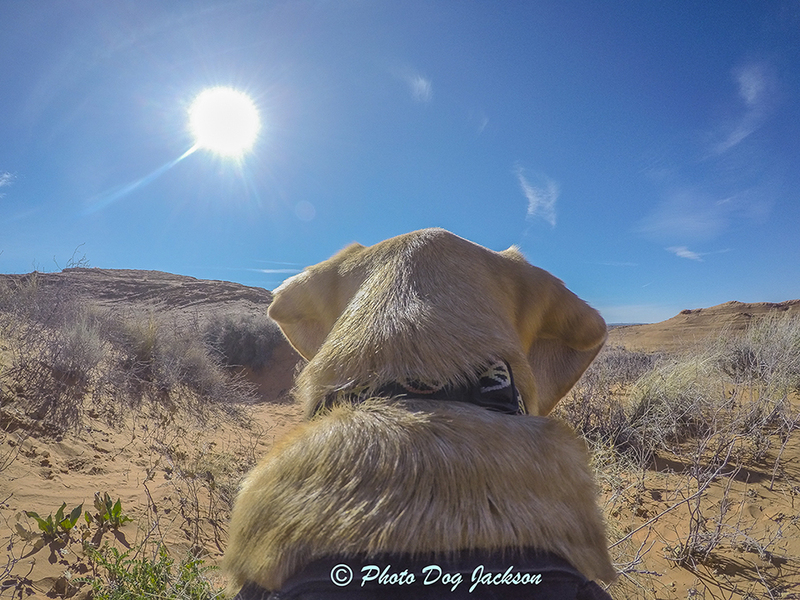 On our drive up we made several stops, one was right after leaving Page at Lake Powell and my human didn’t even let me swim there, ruff! Then we went on a hike in the Grand Staircase-Escalante area called the Toadstool Trail and I see why they are called that. Matt said they were also called hoodoos, ruff, such strange names out here in the west. Then we stopped at the Coral Pink Sand Dunes State Park. I watched my human hike out in the sand while I waited under a shady platform, it was hot that day. 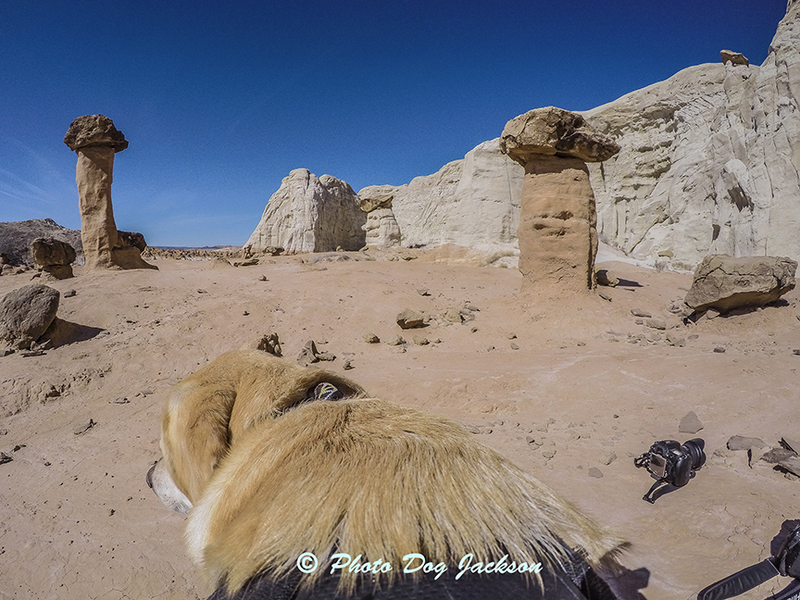 One view of some of the toadstools, or hoodoos! Another view of the toadstools. 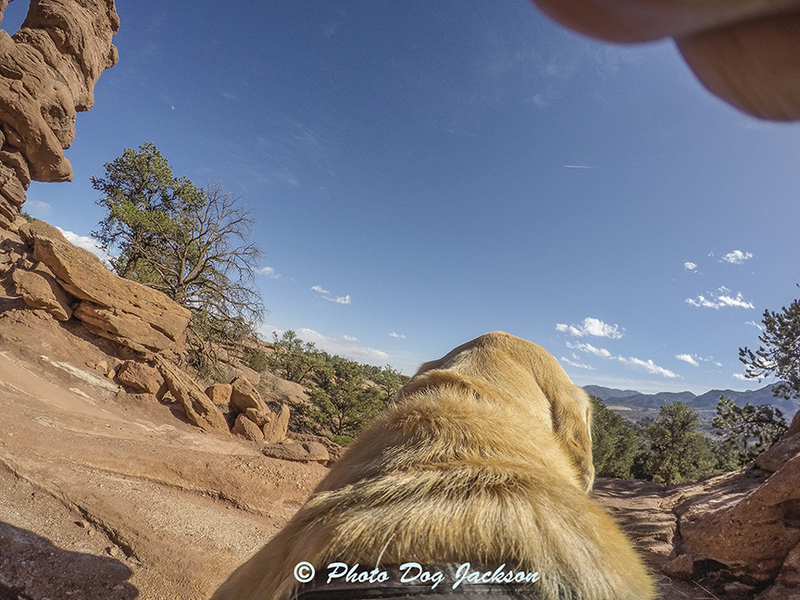 Matt left his cameras in my photograph, ruff! 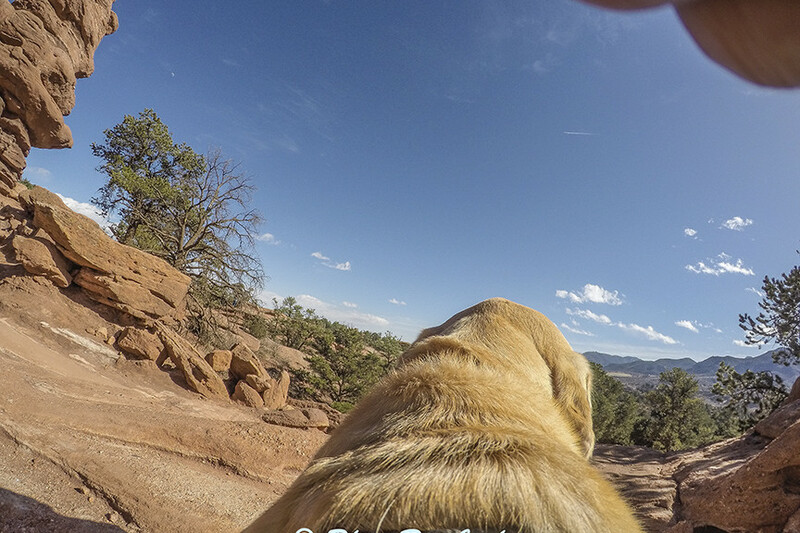 When we got to Zion National Park I could tell my human needed some rest so I told him to get a room somewhere that allows dogs. 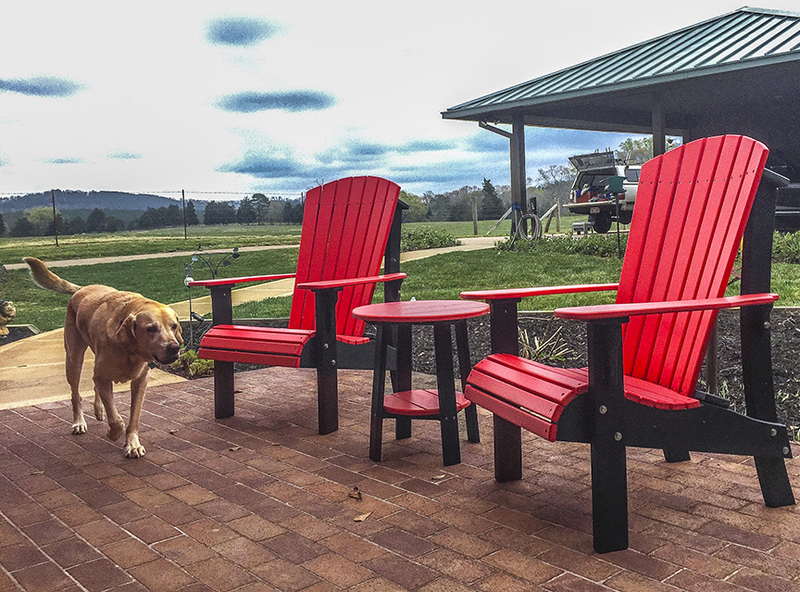 Can you imagine some places don’t ike dogs? One place that said they take dogs asked my human if I was shedding, they said they were picky about who they let stay. 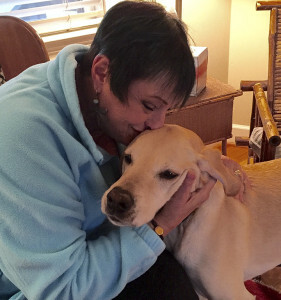 Ruff why even bother saying they take dogs anyway – labs always shed, foo on them, ruff! Yesterday I spent most of the day napping and I tried to get Matt to do the same. He did some, but he stayed working on the computer on our photographs and videos, I finally barked at him and told him to stop so he did, ruff! Then we went for a short drive in the afternoon and stopped by a little cafe in the town we are staying. That town is Springdale, he ate outside so I could sit with him at the table and he gave me some of his pizza to eat, yum that was real good! Today it has been raining so we are resting and Matt has been planning what to do next. 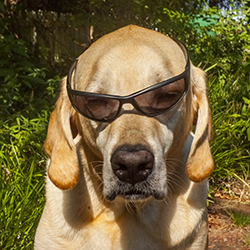 I will not tell yet, but will fill everyone in on my next report, woof, woof! 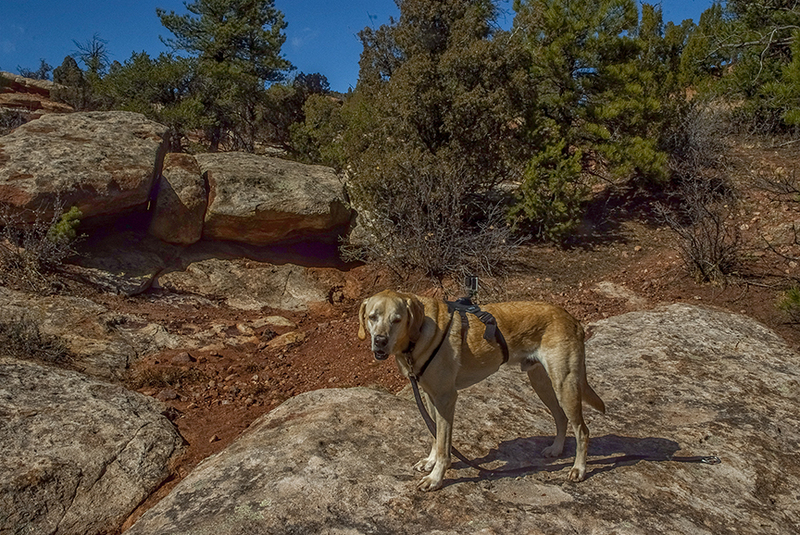 I do know we will be in Zion park for the next day or two so Matt can take more photographs, then we will go to some more parks, ruff! My Tail, woof, I mean Tale! 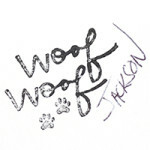 Woof, woof, well Matt has been slow to write a blog entry so I told him I would write one for him today. I’ll try to contain my excitement and keep my woofs and ruffs to a minimum. 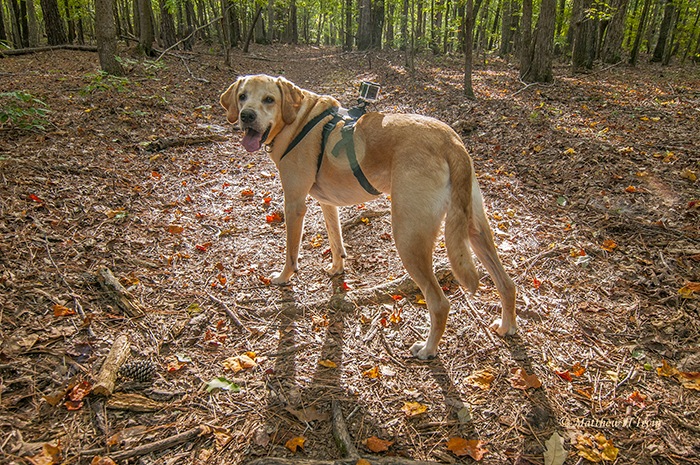 I have really enjoyed taking pictures with my human and jump for joy anytime he gets my harness and camera; I am always ready to go. I eagerly await the words, “ride”, “outside”, “play” and anything like that. Where do I start? Well I usually tell Matt to start at the beginning so I should take my own advice. A long time ago I found myself back at that place called a shelter, where all the dogs and cats live, for a second time in my life. I was so confused, that day I was two-years-old I thought I was part of a pack, and I thought I was going on a fun ride with my human. Then they left me in that shelter again. I was shocked and hurt, she left me there! I knew something was wrong because I had been there before. After two days had passed I was trying to get someone’s attention to take me away from that awful place. One human came over and played a little with me and then called out “Hey Matt come over and see this dog!” When I saw this human named Matt, I knew this was my person. I had to find a way to go home with him so I ran over, jumped up on him, and in my excitement I accidently stuck my paw in his mouth! I knew I had better make things right after that mistake so I quickly ran over and got a ball to make him forget the paw. To my joy he threw it for me, I was so excited, and then he threw it again, and again. It must have worked because the next thing I knew is I was in a car with him leaving that dog and cat place once again. I sure hope I don’t ever go back. 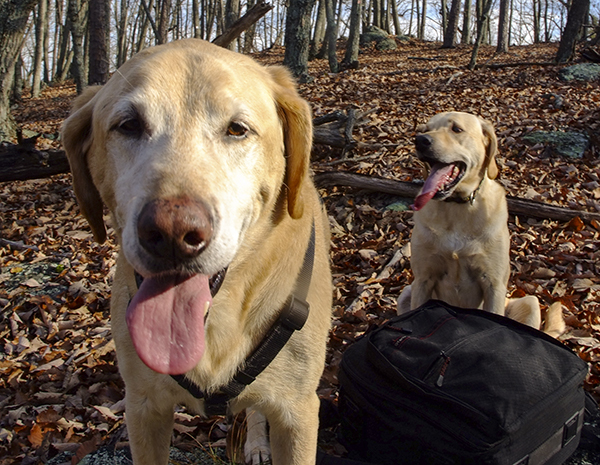 Maverick (foreground) and Jackson (behind the pack) resting during a hike at Morrow Mountain. .
My life since has been quite an adventure after I joined Matt’s pack. There were three of us, Maverick, my new human, and me. At first Maverick didn’t like me, but later we became great buddies. 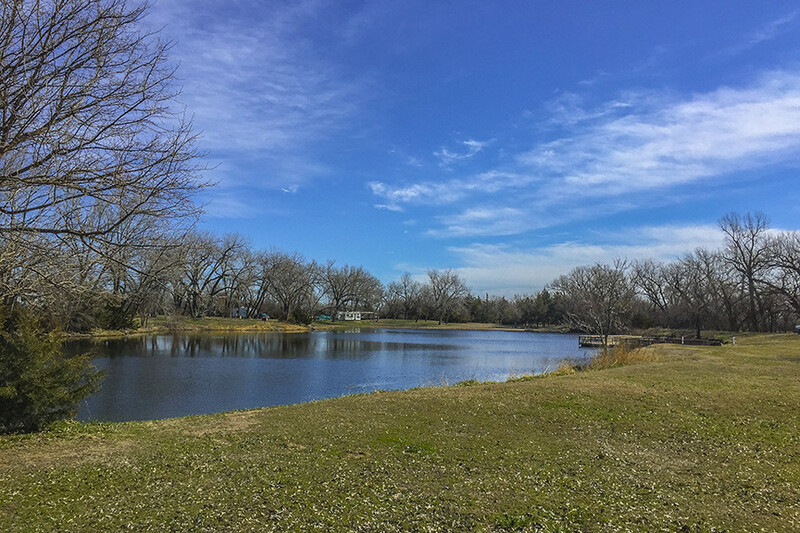 Earlier this year Maverick went to a place Matt called “The Rainbow Bridge” I don’t know what that means. I just know Matt was sad when he came home without Maverick one day and I was sad too. 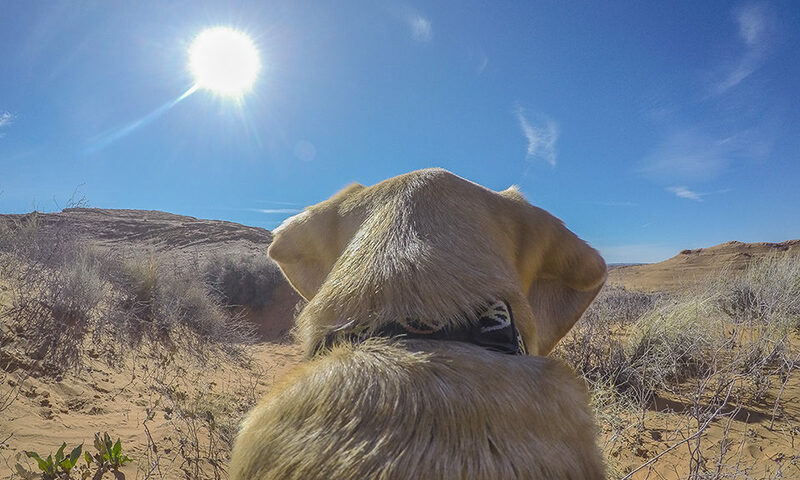 When my human first got me we all went on hiking and camping trips and one backpacking trip. Then things changed for a while. He didn’t go out or play much and I was worried. He was not able to do what he wanted or what I wanted to do. I can always tell when something is wrong with him and I try to comfort him at those times. Sometimes he sleeps a lot, even more than I do, so I am right next to him guarding and watching. He always tries to look and act well in front of other humans, but I can tell when he really is not feeling well. Woof, but now he is more active! Oops there I go, I let a woof out! After a while he did more and we went more places. 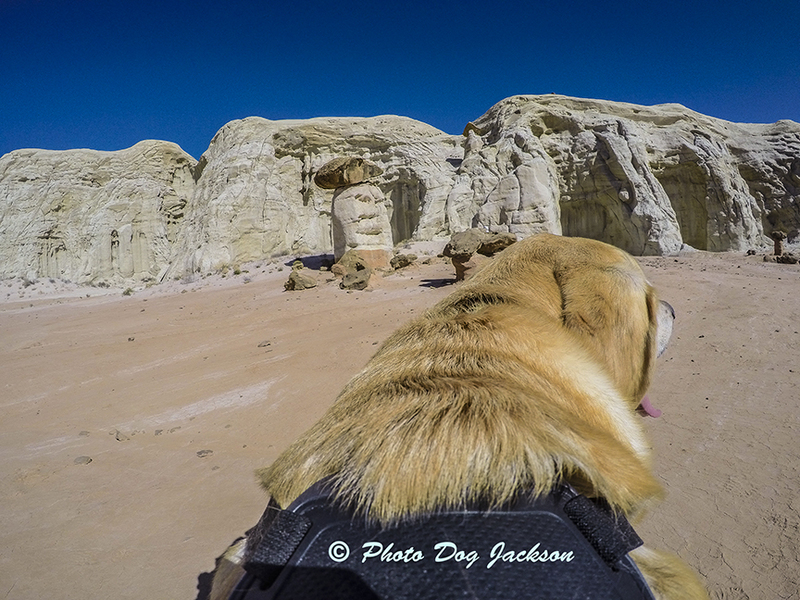 He tells me the backpacking is something we won’t do any more, but we have plenty of camping and hiking to do, Woof! He did let me in on a secret, but don’t let him know I told you. He feels guilty about all the long trips he has taken and left me at doggie camp. Mind you I don’t mind visiting with my friends but I miss Matt when he is gone. 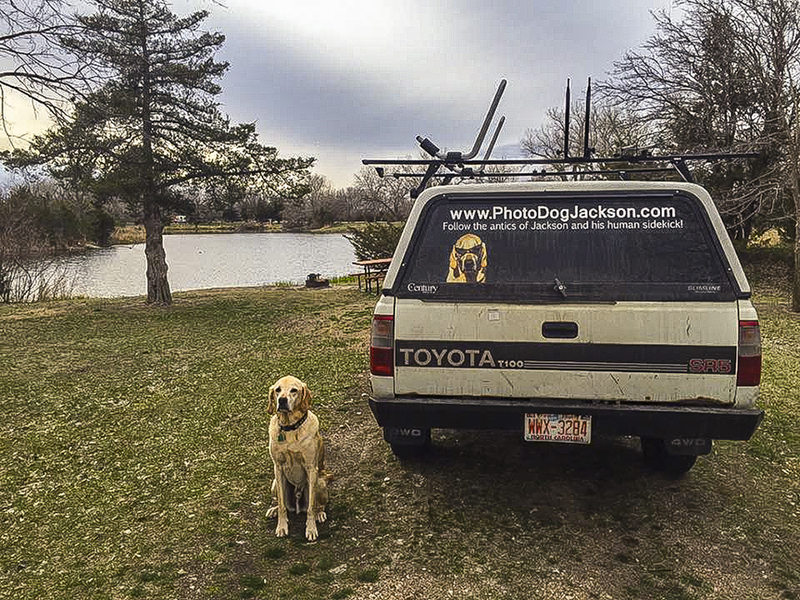 Ruff, I got off track, the secret: he said if he can get the truck fixed up, we are going on a big adventure out west! I don’t know what west is, but a trip sounds great! I hope he can get the truck ready! Well thanks for taking time to read my story and I hope you found it interesting. Now I think it is time to curl up next to the fireplace and take a nap, it is cold this morning. 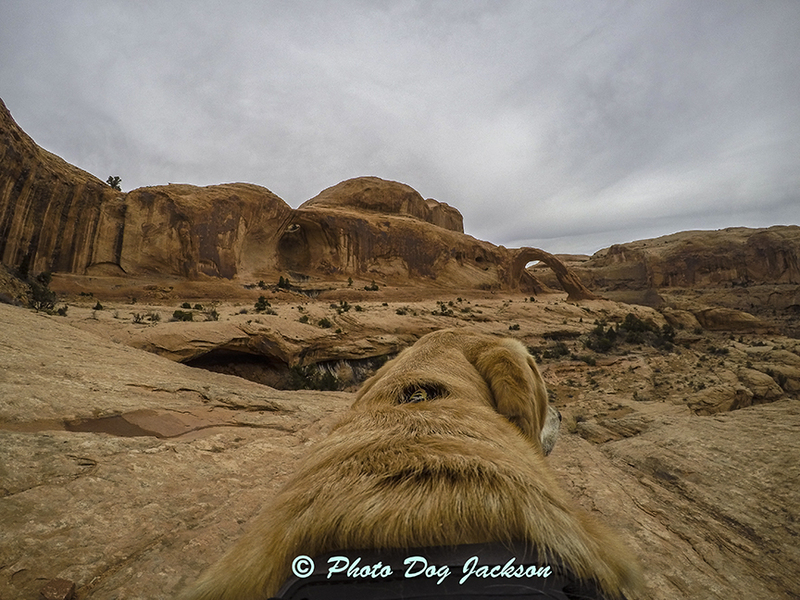 Jackson on the Thornburg Trail in the Uwharries with his GoPro camera.